a variety of styles, including concrete garden tables, patio tables and pedestal tables with optional checkerboard or backgammon patterns. Our concrete patio furniture is manufactured to last, with quality-reinforced concrete construction. We offer 15 unique styles with additional custom styles available. We also offer a variety of umbrella and hardware options. For more information on our memorial tables, contact us today. 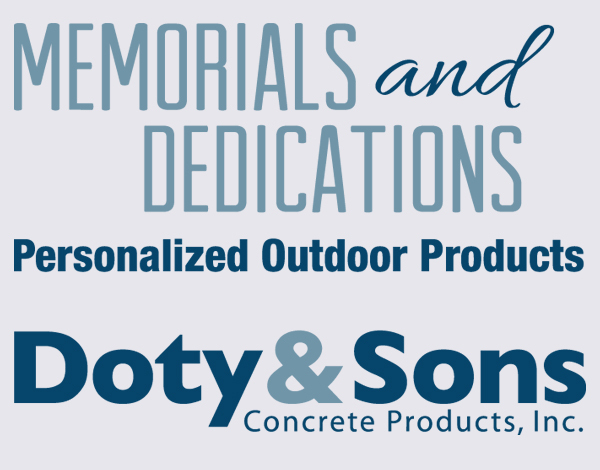 Doty & Sons is a manufacturer of high quality, affordable concrete table sets. If you’re looking for a picnic or patio table and bench set, check out our selection; we have a set for everyone! We carry precast concrete tables and benches that are attractive and durable in a variety of styles, including patio and picnic tables and even a pedestal table with an optional checkerboard or backgammon pattern. Our concrete products have a variety of options and features, so you can find exactly what you’re looking for right here. Remember us anytime you need precast concrete outdoor tables and bench sets! 15 styles available. See www.dotyconcrete.com for other styles. See individual item for details.